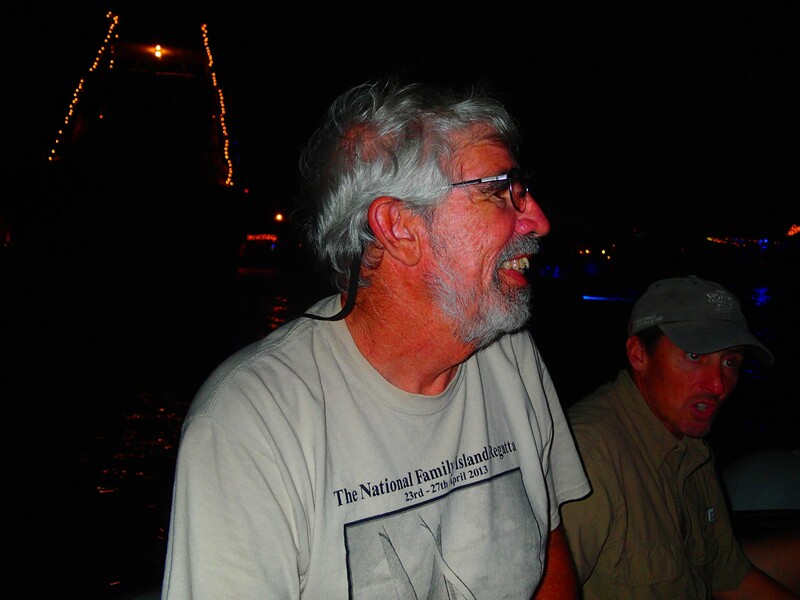 1/29/13 – We are actually in George Town, Exumas, Bahamas on a mooring ball in hurricane hole #2. I am trying to update some of my photos from earlier. These are from the Miami area. Click on them if you want to see a larger version. 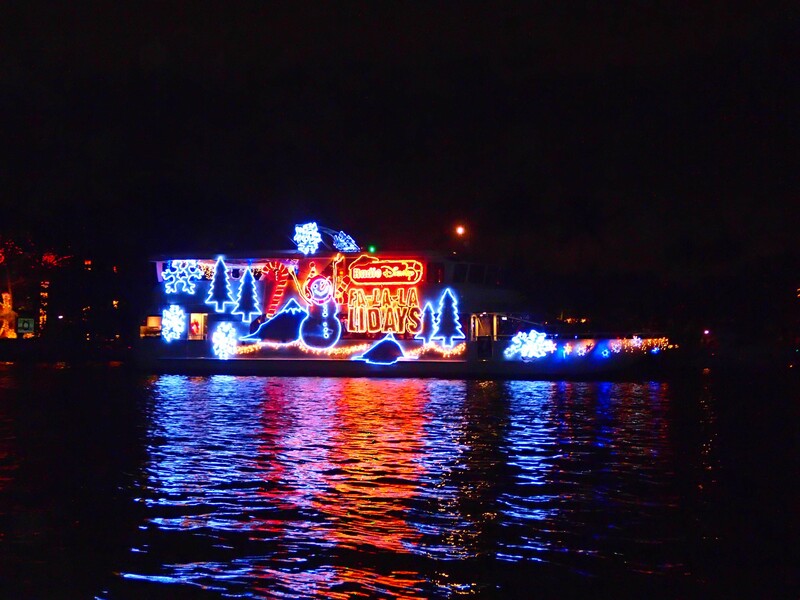 12/17/13 – Cruisin’ the Miami area. 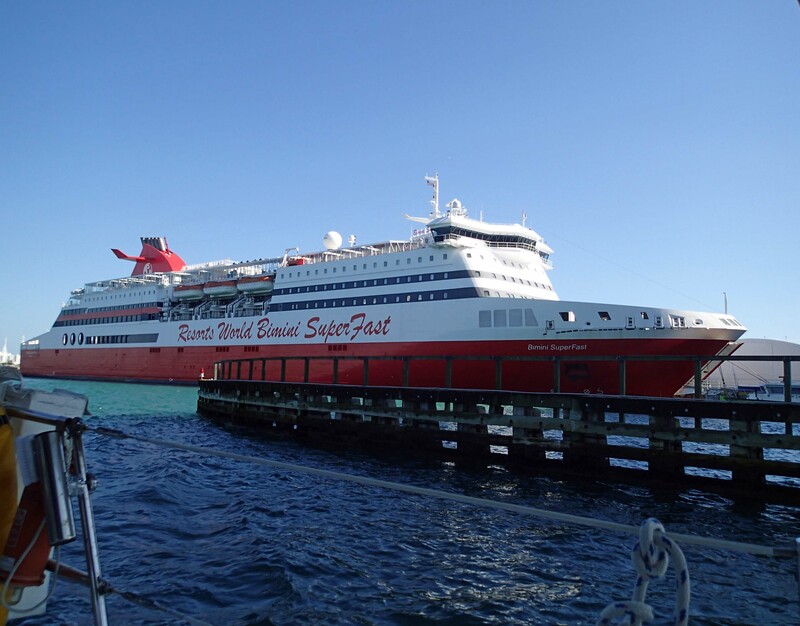 We saw the Resorts World Super Fast Ferry that takes you to Bimini for a reasonable fee. It was much bigger than I thought it would be. The reviews on it are not so great since they try to get you to Bimini and back quickly. They only give the passengers 3 hours or less on the island before it’s time to return. Of course, you could always get a hotel and come back a different day or come see one of your boater friends while they are hanging out there! The Super Fast Ferry can get you to Bimini in a hurry! It’s always fun to anchor out in South Beach, Miami. So many things to do and see! The main attraction is Lincoln Road with all of it’s shops and beautiful people! We usually anchor out at Sunset Lake or by the Venetian Causeway. This is where we do our final provisioning before staging to head over to the Bahamas. There are no shortages for grocery and gourmet shops…the choices are endless. We are having a great time with Harry and Fran/SIRIUS. It makes it fun to have friends to play with! 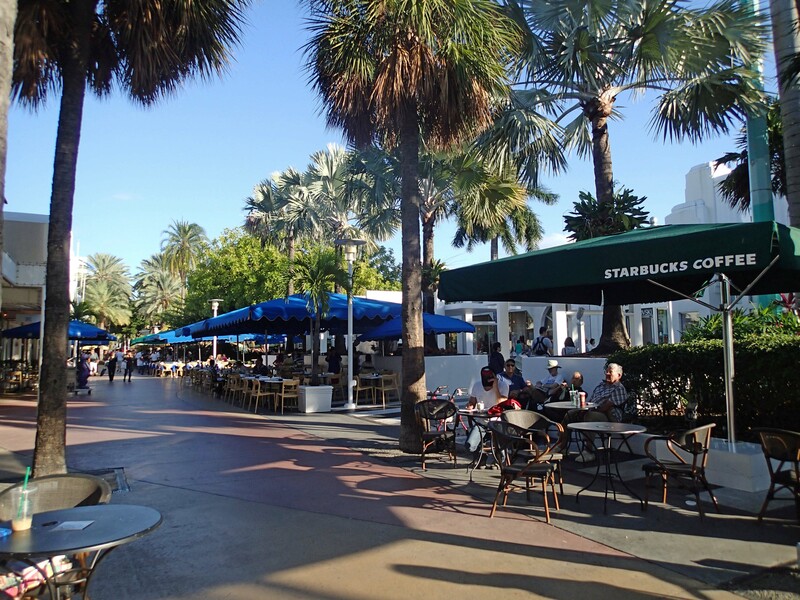 Lincoln Road the place to see and be seen! 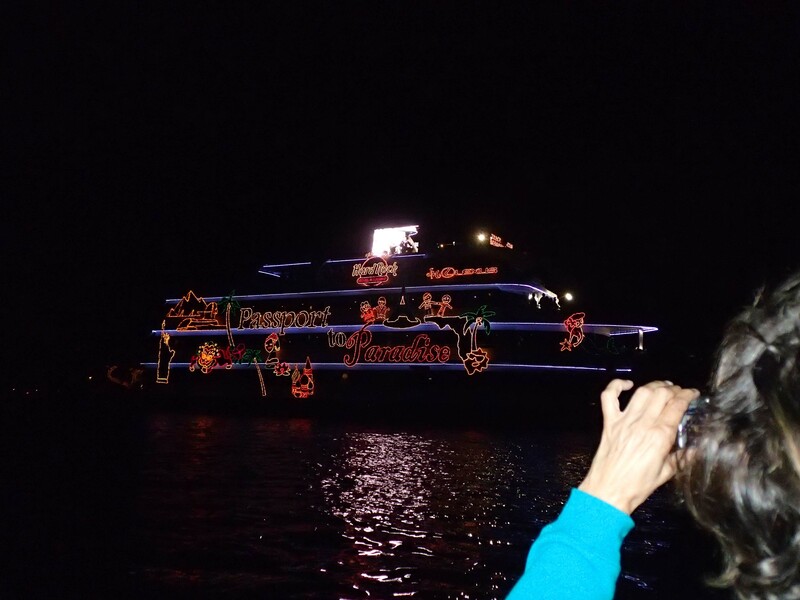 When we were in Fort Lauderdale we got to see the Christmas Boat Parade up close and personal. We took our dinghies out to the ICW and rafted them up together (about 6 of us.) Since we were the smallest boats there we got a front row seat! 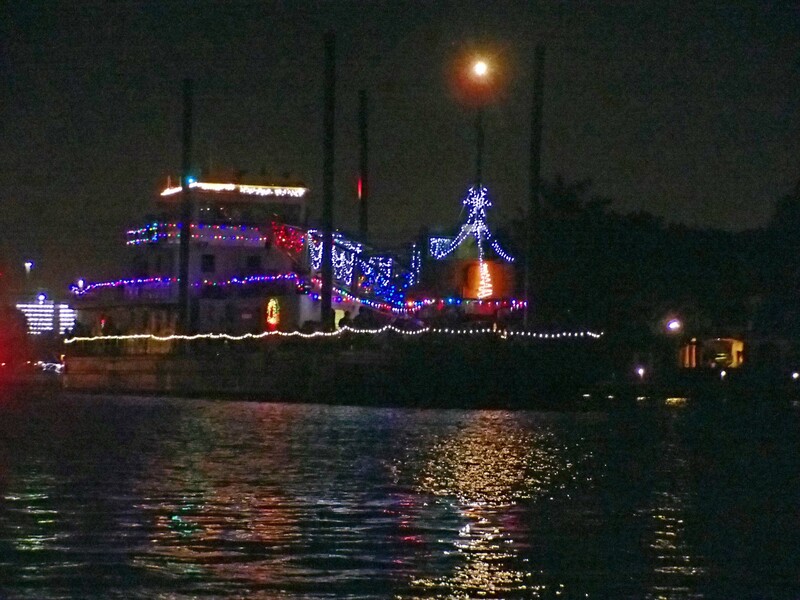 We had Christmas lights on our dinghies and got applause from all the big boats in the parade! It was a great time! Wish I could show you all the boats but the internet here is very limited. The boats had bands, dancers, and all types of entertainment on them. The music was awesome. 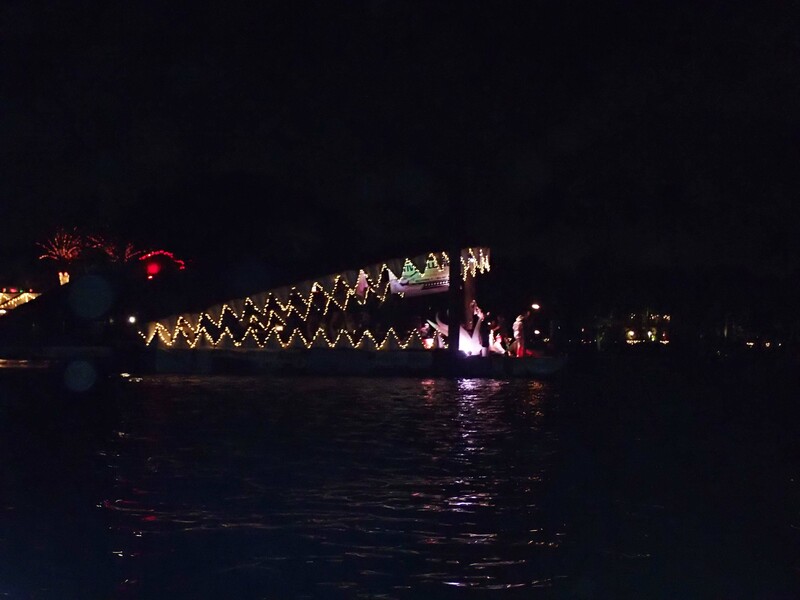 Some were dinner tour boats with everyone eating and dancing on the top sections of the boats. 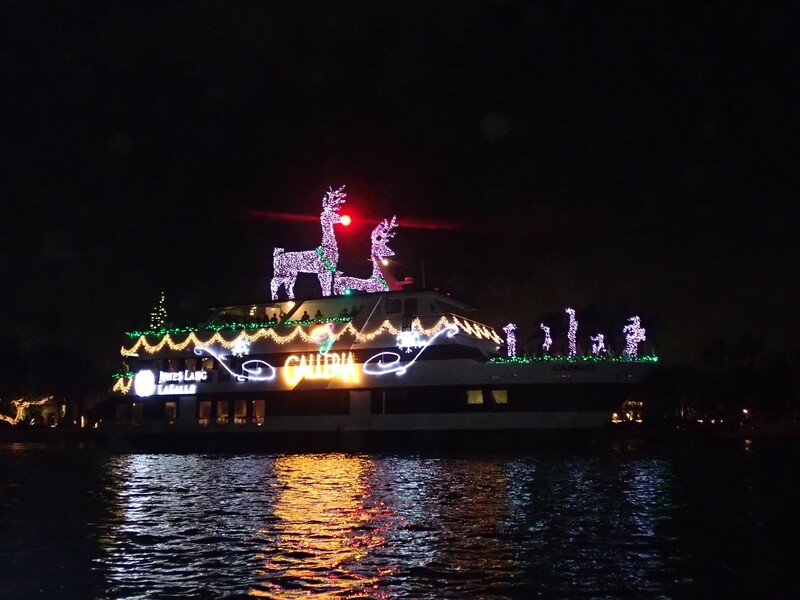 They say that one of the boats spent almost $50,000 on lights for the parade. 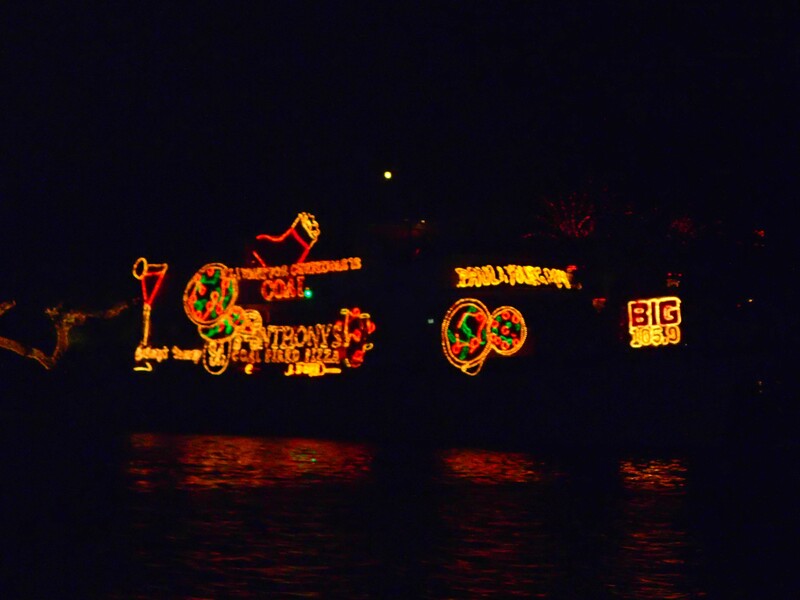 Here are just some of the incredible boats/ships in the parade. The pictures are small but you can click on them to see them bigger. All I can say is that it was incredible! Hope you enjoy the photos! Tom enjoying himself! It was fun! 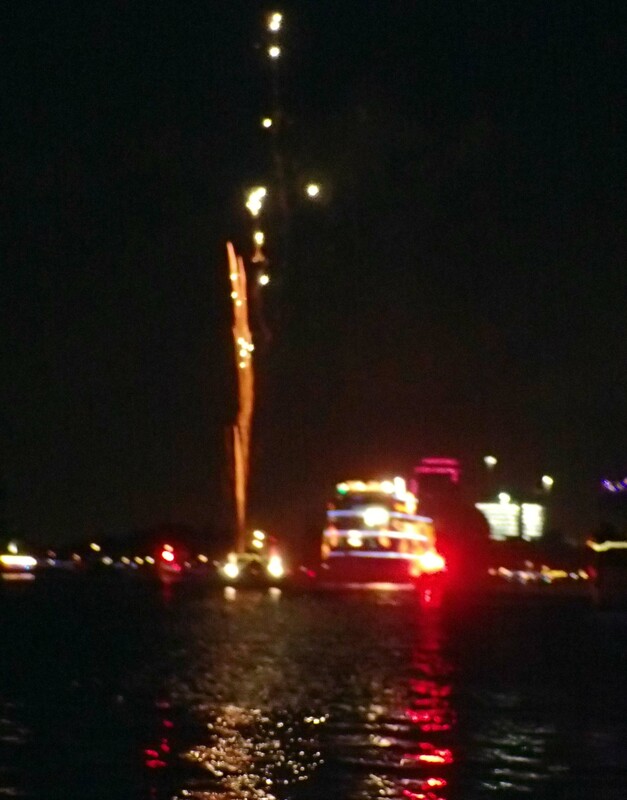 PETA boat was shooting fireworks while underway! This was one of my favorites! Rudolph was so tall! His red nose was very bright! This boat was in the shape of an alligator. It’s jaws went up and down and it had dancers and a band on board. Warderick Wells, Exuma Land and Sea Park, Bahamas – hiding from the snow! We are in Warderick Wells. It is very beautiful and warm. Sad to see that so many are having a brutal winter! Internet is very poor here so I will send photos and more details later. We are planning to head to Staniel Cay on Monday or Thursday…weather depending.